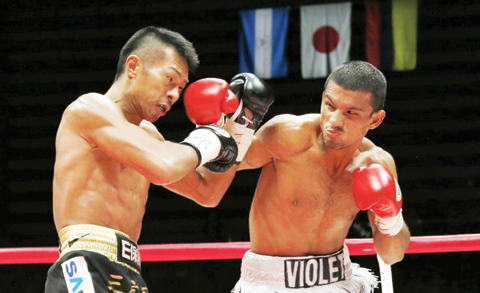 TOKYO: Undefeated champion Takashi Uchiyama of Japan on Thursday successfully defended his World Boxing Association super featherweight title for the 11th time, beating Nicaraguan Oliver Flores with a technical knockout. Uchiyama (24-0-1, 20 knockouts) went into the New Year’s Eve bout clearly at ease against his challenger, 24. Victory for the veteran Japanese titleholder, 36, came quickly-one minute and 47 seconds into the third round-when a single left body blow put the Nicaraguan fighter flat on the canvas. It was a technical knockout as Flores (27-2-2, 17 knockouts) was declared no longer capable of continuing to fight before the end of the count. “I am in very good condition,” Uchiyama said after the bout. “I tried to take it easy in the first few rounds.” The headline bout was part of a WBA doubleheader at Ota Ward General Gymnasium in Tokyo. Meanwhile, Filipino boxing icon Manny Pacquiao will return to the ring on April 9 in Las Vegas to take on Timothy Bradley for a third time, promoter Bob Arum said Wednesday. Top Rank promotions chief Arum confirmed to AFP that the bout was slated for the MGM Grand. While Pacquiao has spoken this year of retiring after an April bout to pursue his political career, Arum said he would not market the bout as Pacquiao’s last. A congressman since 2010, Pacquiao announced in October that he would seek a seat in the Philippines senate in 2016. The 37-year-old, who owns a record of 57-6-2 with 38 knockouts, hasn’t fought since a May 2 unanimous decision loss to unbeaten Floyd Mayweather in their long-awaited bout that shattered revenue records for the sport, generating some 4.5 million pay-per-view purchases and $600 million in gross revenue. This week in a question and answer with fans on his Facebook page Pacquiao said his shoulder was “100 percent”. Arum, too, said the shoulder “seems to be 100 percent”. “He’s playing basketball with it, scuba diving with it,” Arum said. Although not all the paperwork has been finalized, Arum said there were no obstacles to the fight taking place, with major terms such as guaranteed money and the purse split decided. “These fighters have fought for me for many years,” he said, adding that the fight would be formally announced with Stateside press conferences in January. Pacquiao and Bradley have met twice before, with the American taking a controversial split decision in a fight many thought Pacquiao had won in June of 2012. Pacquiao avenged the polarizing defeat and regained the World Boxing Organization welterweight world title with a 12-round unanimous decision over Bradley in April of 2014. Bradley, 33-1-1 with 13 knockouts, has since regained the WBO welterweight belt and will be coming off a ninth-round technical knockout of Brandon Rios on November 7.